Mobutu Sese Seko sporting a typical abacost in 1983. Authenticité has made us discover our personality by reaching into the depths of our past for the rich cultural heritage left to us by our ancestors. We have no intention of blindly returning to all ancestral customs; rather. We would like to choose those that adapt themselves well to modern life, those that encourage progress, and those that create a way of life and thought that are essentially ours. Though continually glorified by Mobutu and his statesmen, the authenticity campaign was the means through which the dictator intended to vindicate his own brand of leadership. He himself, in an effort to link his ideology and his political dominance, stated just before proclaiming authenticité that, "in our African tradition there are never two chiefs... That is why we Congolese, in the desire to conform to the traditions of our continent, have resolved to group all the energies of the citizens of our country under the banner of a single national party" despite the necessity of a lessening of tribal identity in order to promote national unity. Greatly a result of Mobutu’s 1973 visit to Beijing, Zairian males were strongly urged, and then required, to abandon Western suits and ties for the Mao-style tunic that he named the "abacost", a word derived from the pronunciation of the French à bas le costume ("down with the suit"). A female equivalent of the national attire was also created. The most widely recognized result of authenticité was no doubt the renaming of the nation from the Republic of the Congo to Zaire, a Portuguese mispronunciation of the Kikongo word nzere or nzadi, which translates as "the river that swallows all rivers." It is generally unknown why the head of state chose a Portuguese colonial name instead of an authentic Congolese name. A biography about the President by Le Monde journalist Jean-Pierre Langellier, however, traces the naming of the currency zaire back to a dinner Mobutu had with his economic adviser Jacques de Groote and Belgian anthropoligst Jan Vansina, where the latter came up with the term as it believably designates, in different local languages including Kikongo, the "river which swallows all streams". Mobutu also renamed the Congo river and the national currency "Zaire", and referred to them as "Les Trois Z—Notre Pays, Notre Fleuve, Notre Monnaie" ("The Three Zs—Our Country, Our River, Our Money"). In addition, cities were renamed appropriately (Léopoldville as Kinshasa and Stanleyville as Kisangani). Streets, bridges, and other geographic features, as well as the armed forces, received name changes. Zairians were urged to drop their Western or Christian names in favor of Zairian names. 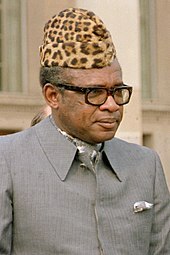 Mobutu changed his own name from Joseph-Désiré Mobutu to Mobutu Sese Seko Kuku Ngbendu Wa Za Banga (more commonly abbreviated to Mobutu Sese Seko). The Catholic hierarchy quickly came to view the retour à l'authenticité as a threat to Christianity in Zaire (in the early 1990s almost half of the population was Catholic). The regime's stress on "mental decolonization" and "cultural dis-alienation" could be interpreted as an attack on Christianity as a product of Western influence, as could the emphasis on African culture as an alternative to widespread continuing Westernization. Also, the banning of Christian names was a measure that particularly offended the church. As part of his re-organization of Zairean life, Mobutu banned all outside Christian religious groups, requiring those who would function in Zaire to become part of one of four recognized umbrella groups. The four were: the Kimbanguist Church (a syncretic church of Zairian origin), the Catholic Church, the Orthodox Churches, and Les Églises du Christ au Zaire (ECZ, now Church of Christ in Congo), which covered most of the Protestant confessions. All others were declared illegal. The various Protestant churches had to affiliate with the last of these as communities within the ECZ in Zaire. At the time there were numerous local sects and church groups which had sprung up, and it is believed Mobutu wanted to control these, as well as the churches in general. Under the state and party ideology of authenticity, all citizens were equal and the appropriate term of address among all Zairians became citoyen, or citizen. The term was mandated for public use in order to do away with the perceived hierarchical distinctions of monsieur and madame. Visiting heads of state were greeted with African drumming and singing as opposed to the 21-gun salute, traditional in Western practice. The state urged that all traditional works of art be returned to the country so as to inspire Zairian artists and ensure the incorporation of traditional styles into contemporary artwork. Although many of the changes instituted as part of authenticité lasted nearly to the end of the Mobutu regime or beyond it, the ideology had begun to wane by the late 1970s as it could do little more to benefit Mobutu’s kleptocratic regime. Mobutu's announcement of the transition to the Third Republic in 1990, which included most notably a three party system, came with the freedom to return to more universal forms of address and to wear a suit and tie. Also, by the 1990s many Zairians had resumed use of their given names. After Mobutu was forced to flee the country in the First Congo War in 1997, President Laurent Kabila officially abolished Zaire's authenticité policy and renamed the country the Democratic Republic of the Congo. ^ Translated literally from French as "authenticity", but can also be interpreted as "sincerity" and "genuineness" (pronounced [otɑ̃tisite]). ^ Kabwit, Ghislain C., "Zaire: The Roots of the Continuing Crisis." The Journal of Modern African Studies. Vol. 17, No. 3 (Sep., 1979), pp. 381-407. ^ Langellier, Jean-Pierre. (2017). Mobutu. Perrin. ISBN 978-2-262-04953-9, 169. Adelman, Kenneth Lee. "The Recourse to Authenticity and Negritude in Zaire." The Journal of Modern African Studies, Vol. 13, No. 1 (Mar., 1975), pp. 134–139. Dunn, Kevin C. (2003). Imagining the Congo: The International Relations of Identity. Palgrave Macmillan. ISBN 978-1-4039-6160-0. Kabwit, Ghislain C.. "Zaire: The Roots of the Continuing Crisis." The Journal of Modern African Studies. Vol. 17, No. 3 (Sep., 1979), pp. 381–407.